Giri travels 4 miles towards north. He turns to the left and travels 6 miles. Then he turns right and travels 4 miles. How far is he from the starting point? If I stand on my head with my face pointing Northwest, in which direction will my right hand point. 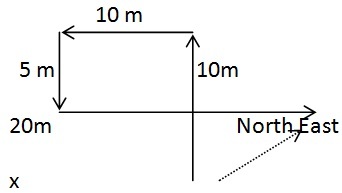 In standing position your right hand points towards North East, but in reverse position the directions also get reversed, opposite side of North Ease is South West. 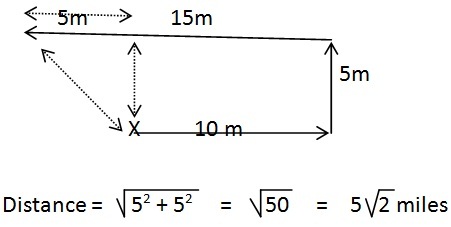 If Mani starts from point X and walks 6 Km towards East, then turns left and walks 4 km towards North, turns left again and walks 3 Km, in which direction is she going at the end. The time on Topyâ€™s watch is a nine fifteen, if the minute hand points to North-west, in which direction does the hour hand point? At 9 :15 the handâ€™s of the clock will be in opposite direction, if hour hand points North West then Minutes hand points towards South East. A man walks 7 miles east wards, turns right and travels 3 miles and further turns right and travels 11 miles. How far is he from the starting point? 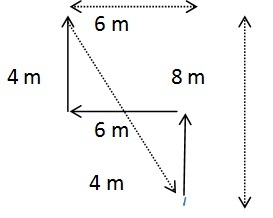 From a Same point, A and B started walking in opposite directions A covers 3 miles and B 4 miles. Then A turns right and walks 4 miles and B turns left and walks 3 miles. How far are they from each other? A man started walking from a point towards south. He turned right and right angles, then again right at right at right angles. In what direction was he ultimately walking? I went 15 miles to the north, then I turned west and covered 10 miles, then I turned south and covered 5 miles, and then I turned east and covered 20 miles. In which direction am I from the starting point. Shubha went 10 m to the east, then turned north and walked another 5 m. then he turned west and covered 15m. How far is she from the starting point? 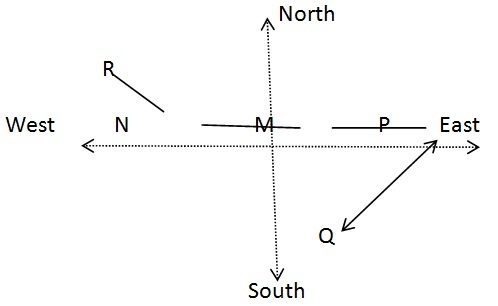 M is east of N and West of P, Q is south west of P. N is south-east of R which is the farthest East?